The Malaysian Communications and Multimedia Commission (MCMC) said in a statement the attacks on websites with the .gov.my domain started shortly before midnight Wednesday and lasted several hours. Little damage was caused and these were denial of service attacks. Apparently most of the websites have already recovered. 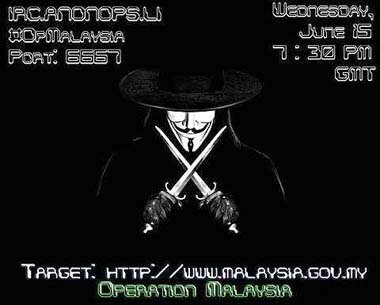 Anonymous warned on a website that it would target the government portal www.Malaysia.gov.my on Wednesday. It was still down this morning. It is interesting that it has just woken up to this problem. Malaysia's media operate under strict censorship laws. Until now websites have remained relatively free, due to an official pledge not to censor the Internet in a bit to get foreign cash into the country.